Andre Wallace joined the Greywolf Brokerage team as a Broker Associate in March of 2017 and is working out of our Milwaukee office. Originally from Sun Prairie, Andre attended the University of Wisconsin - Oshkosh, where he earned his bachelor’s degree in Human Services and minored in African American Studies. 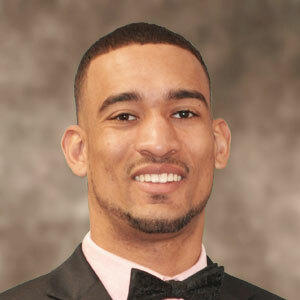 He played on the Men’s Basketball team and became a McNair Scholar. He also served as Vice President on the Student Athlete Advisory Committee (SAAC), was Commencement Speaker Runner-up, Dean of Students, and nominated for the John Taylor Scholar Athlete Award and NABC Honors Court and is now pursuing his MBA at the University of Wisconsin - Milwaukee. Andre currently holds a real estate license for the state of WI and is a member of Greater Milwaukee Association of REALTORS, (GMAR), and the Commercial Association of REALTORS Wisconsin (CARW). In his free time Andre enjoys listening to music, working out, and spending time with his dog, Kash.